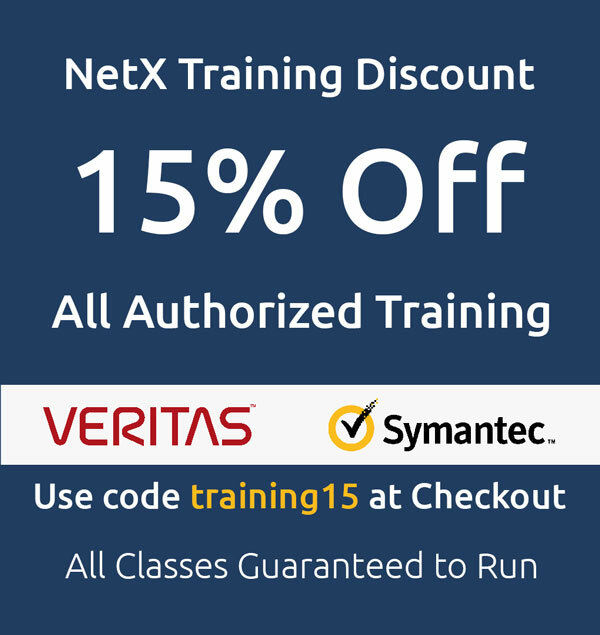 NetX delivers both online and onsite instructor-led Symantec training and Veritas training courses. High-quality information security and information management training courses are designed for system administrators, managers, operators, developers, and end users who need to get the job done. Instructors deliver comprehensive ‘Real World – Hands On’ Veritas and Symantec training courses. The instructor is available for the duration of the Symantec or Veritas training course for student questions and discussion. Symantec training and Veritas training consist of an in-depth presentation and hands-on experience followed by lab access and direct assistance from a Master Accredited Engineer. The dedicated lab environment gives students 24-hour access, allowing each student to practice labs as their schedule permits. Live, instructor-led training courses for Symantec and Veritas are broadcast virtual/online, so you can remotely attend from any location with a computer and internet connection. If you have 4 or more students that require onsite software training at your location, please contact us for a custom pricing quote.